Someone needed a MR. POTATO HEAD. He took a little longer than I thought, but who knew potatoes had teeth anyway! *HA HA HA HA*. He is made with George. WOW! Susanuncle got on the ball with this design! She made the cutest card with Mr. Potato Head! Thanks for sharing the photo Susan! If you don't know Susanuncle let me tell ya she is just like one of the MOST MAJOR AWESOME PEOPLE EVUUHHH! Check her out at Susanbluerobot! Mr. Potato Head!!! Now I know there's nothing you can't do. Good job. Adorable, thanks for all of your ideas. Fabulous work. Hi, I have been scrapbooking for a long time but just recently got my Cricut. I am very new to Design Studio. Your work is awesome, I LOVE what you do. I was wondering if you know if there is anywhere I can go to find anything to do with cheerleading, ie: megaphone or poms? I am sure it would be easy to do, but again I am very very new to DS. At at this time I only have George and Base Camp. Any advice?? Laura what I do is look for clipart of a design I am needing to do and replicate it. I usually have the clip art pulled up, make the window smaller, make my DS window smaller so I can see both at the same time. When I used to teach pre-school I used to dress up as Mrs. Potato Head for Halloween. I'm sure that there is a photo somewhere that I can scrap. Thanks so much! I love him! BTW, great blog! Thanks for all you do! You are very creative. 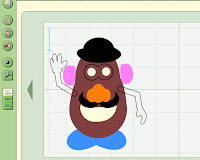 My son was sitting on couch near me as i opened the site and saw your Mr Potatoe head. He literally, came over and pushed between me and my laptop to see Mr. P upclose. :) I guess I'll have to cut one (not in card form) just for him. THANKS!!! Thanks so much for the Potato Head file. I have been wanting to scrap our pictures from WDW and DL with the new Toy Story ride, and needed something like this. I was going to try to design it myself, but didn't have the time. Then someone told me that you had a cut file for him already. YEAH!!! I'm so excited to try it! Thanks again for yor hard work. Oh my gosh!!! My BFF is addicted to Mr. Potato Head. She is a K teacher and collects them to use in her classroom. She is sick today so I made here a Mr. 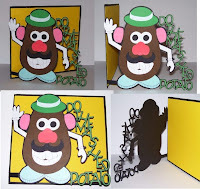 Potato Head get well card. TOOOOOO CUTE!!!! We had just a little trouble figuring out the teeth..but all in all it was easy and cute! Thanks so much for sharing it!!! I will try to upload a picture soon! With Toy Story 3 coming out, this will come in handy! You may even want to repost this!